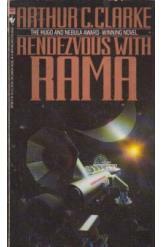 Rendezvous With Rama by Arthur C. Clarke, Sci Fi. Book is in good condition, all pages intact. A ten trillion ton alien spacecraft speeds toward Earth. A team of brave astronauts and scientists prepare to land on the mysterious "Rama" and see what secrets it contains. Book one of the "Rama" series.